Guys, why is this happening? As you can see, Mammoth is looking fine in HVA editor, but ingame, its turret is higher. That happened after resize in voxel editor, and he usually fucks up hva, so I need to set it. When I set it like this to look normal, ingame it is usually weird with some voxels. Did you saved it under voxel offset or HVA position? Just delete both hva files and re-open then in hva builder and look that position is ok and if not adjust by voxel offset. Alternatively I hope you did bounds reset after resize and then corrected back to fitting size. I did first under hva position, then I did it under voxel offset, and after long time I solved it. it is not looking good in HVA editor, but is looking good ingame which is important. Just delete both hva files and re-open then in hva builder and look that position is ok and if not adjust by voxel offset. I should do that at first place, not to ztype around with setting those position and testing ingame for one hour or more. Alternatively I hope you did bounds reset after resize and then corrected back to fitting size. Actually, I wanted to resize mammoth by 30% then I double sized it in voxel editor, then manually edited bounds by calculator by multiplying them by 0.7. After that it just screws up hva file. What should I do exactly about that? What you did, is resize and then go adjust the already wrong bounds to even more wrong as VXLSE does not correct the bounds after resize at all or canvas change for that matter. Umm... it does, I actually find it annoying as I like to manually set the bounds but VXLSE changes them with any edit to the size of the vxl. It was added at some point, older versions such as 1.36 (which I think is what Apollo is using) didn't do this. 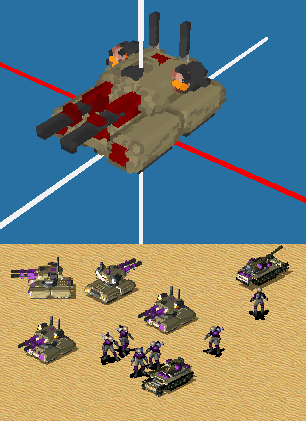 So Starkku, Mig Eater, if it corrects, then what is wrong, why my turret/voxel got weird ingame? It's very hard to help without actually seeing the vxl & exactly what you've done with it. Upload it so we can take a closer look. Mig Eater ah yes I am using 1.39 too, but on icon, when I hover over it it says 1.37, but when I open it, it is 1.39 actually. Mig eater, well really I did not do anything, I did not change even single pixel, I just recolored it from GDI to Yuri scheme. Problem is after resize, turret appeared up, and voxel down. When I fix it in HVA builder, its still weird in game. I f I manually fix it move by move in game, then it look weird in HVa builder. But before resize model was fine both ingame and in HVA. So,I just wanted quick details what could possibly be problem, I do not want to waste your time on this, but I may upload voxel, thats not problem. But Voxel Section Editor often does that especially to turreted and barreled voxels. Yea, genious. Bear in mind that VXLSE III 1.39 installation does not create shortcuts in your desktop or start menu . its same whenever I click in shortcut or open it directly from its folder. With measure tool, new 3D modelizer and such. What is the problem? Also, as I remember, installation was automatically downloading/upgrading old one to new one, something like that I cant remember. So, if shortcut is leftover from old version, I do not see problem about it, I see problem when it screws HVA sometimes, not directly hva, voxel position/bounds/whatever it screws.